ACNETONE: For relief of erruptions on the face and head, relief of burning and itching. 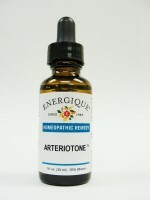 ARTERIOTONE: Hardening of arteries, hypertension, peripheral arteriosclerosis, claudication, gangrene. CYSTOTONE: Bladder infection, irritation. Relief of intolerable urging and tenesmus, pressure in the area of the bladder, urination often. ELIMITONE: Lymphatic drainage, immune system support. For temporary relief of swelfings with heat and inﬂammation, sore throat. FLUTONE: Relief of minor aches and pains in muscles and joints, fever with dryness of mucous membranes and dry cough, chilliness, and headaches. GASTROTONE: Relief of indigestion, nausea, retching, vomiting after eating or drinking, minor burning pain in the stomach. HEMOTONE: Relief of lack of appetite, especially among children, weakness because of loss of blood during heavy menses, paleness of the skin. METABOTONE: For relief of tiredness, weakness, general fatigue, exhaustion, weakness of memory. OSTEOTONE: Relief of aching, burning, tearing pains in muscles and bones. PNEUMOTONE: Chronic lung disease. For relief of dry, hacking cough, hoarseness, bronchial congestion and hay fever symptoms, difficulty breathing with tightness of chest from constriction of chest. PROSTATONE: Prostatitis, prostatic hypertrophy - For relief of pain down thighs during efforts to urinate, great straining and constant urging when urinating. RENATONE: Bladder infection, irritation - Relief of intolerable urging and tenesmus, pressure in the area of the bladder, urination often. SINUTONE: Relief of allergic rhinitis with runny nose, nasal mucous with yellow green discharge, pain and swelling of sinus cavities and postnasal drip. TRAUMATONE: Relief of soreness afler exertion, pain and swelling in joints after strain or sprain, bruised joints and tendons. VERTITONE: Vertigo, motion sickness, Mesniere's disease. For relief of dizziness, motion sickness with nausea.